Is your little one approaching the age of potty training? Then this might be a good time to consider investing in a potty chair or a seat. To find the best potty products on the market, we’ve done the dirty work for you. As a new mom, it can get tiring having to change a diaper every few hours, day and night, seven days a week. Unfortunately, potty training also requires a lot of patience — there will be accidents, and tears, along the way (source). Luckily, there are ways to make the process a little easier. One of them is to find the perfect potty chair or seat for your little one. We’re here today to help you do just that. Use the links above to check the latest prices or read our in-depth potty chair and seat reviews below. This is perhaps the biggest question of all — potty chair or seat? Some moms swear by a potty chair, while others assure you a seat is the way to go. Let’s find out the differences. Many will advise you to buy a potty chair if your child is smaller. This is mainly because of one thing — they’re less intimidating. A potty chair is basically a mix of a toilet and a chair. The small seat will sit on the ground where your little one can keep their feet on the floor. Then there’s the bowl area, which catches all the — well — poop and pee. A great plus is its portability. A potty chair is generally compact and lightweight, meaning you can place it anywhere. Then as soon as your toddler feels an urge to go, the potty is within sight (source). However, probably the biggest drawback is that you’ll still have to get your hands, and nose, near the poop. Don’t get me wrong, I’ve got nothing against pooping — it’s a natural process. But at some point, you just want to flush it and not see it. Nevertheless, there are different types of potty chairs. So let’s take a look. Standard potty chair: These are very simple and usually budget-friendly — they consist of a single piece without any additional features. That said, they can be messy to clean. 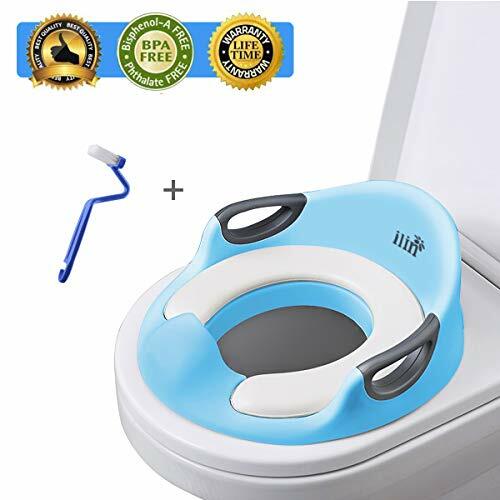 Two-piece potty chair: These generally consist of a standard potty to support your child, with a removable bucket in the bowl area. These are easy to clean. Fancy potty chair: What makes this type fancy are all the extra features you’ll get. Some come with drawers for wipes, deodorizer, lights and sounds, a cushioned seat, and perhaps stickers. 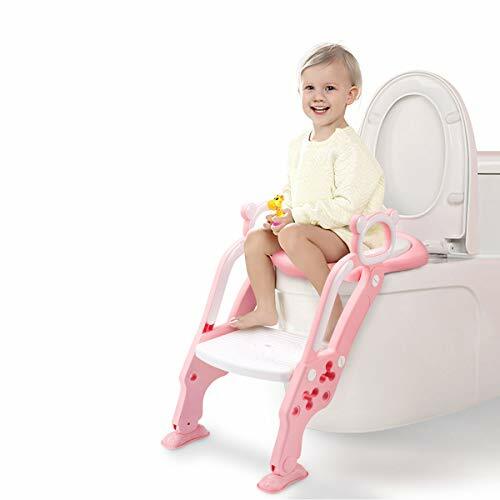 Multi-functioning potty chair: This type is an investment that will grow with your child. These usually serve multiple purposes by converting from a potty chair to a seat and even a stepping stool. Splash guard: This is a little bulge you’ll see at the front. The splash guard is there to keep all the waste inside the bowl. It’s a must-have if you have boys, for obvious reasons. Stability: Whichever potty chair you choose, stability is a must. The last thing you want is for your toddler to tip the whole potty over when sitting on it. Look for a heavier potty, or test it by placing a hand on one side and press down, to make sure it stays put. Design: Toddlers love things that look interesting and fun. Buying a potty chair that looks like a toy will most likely encourage your child to use it. While pretty much any child can use them, potty seats are best for bigger toddlers, or those who don’t feel intimidated by the adult toilet. Potty seats have many benefits. One of them is that there’s less cleaning involved — the waste goes straight into the toilet and you simply flush. Plus, once your toddler feels ready, you just stop using it, no need for another transition. Just remember to measure your toilet to ensure that the potty seat will fit. As opposed to potty chairs, there are really only two types of potty seats. Regular potty seat: This type merely sits on top of the regular seat and you can quickly remove it when it’s not being used. However, your toddler will likely need your assistance to get on and off, unless you purchase a step stool. Two-in-one potty seat: Here you’ll get a seat reducer and a step stool or ladder. This helps your child go whenever they need to without your assistance. That said, these are bulkier and not so easy to remove. Fastener: Depending on which seat you purchase, it might stay fixed to the seat by suction cups, wings or a hinge. Any of these methods will ensure the seat won’t slide off. Beware, though, there are also some seats with no fastenings. Splash guard: Similarly to the potty chair, the splash guard is the small hump at the front, helping to ensure the pee goes in the right direction. Cushioned seat: You’ll likely have a choice between a soft, cushioned seat or a hard plastic one. Plastic is a lot easier to clean, but harder on the little tush. 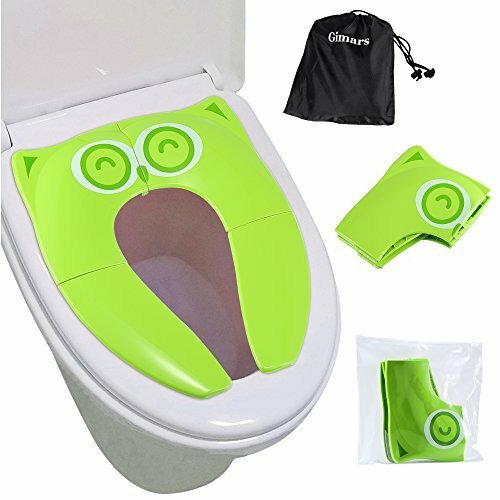 Storage hook: Some potty seats come with a storage hook that can be attached to the toilet. This is a huge advantage when it comes to storing. You can also buy them separately, but make sure they fit the potty seat. Now we’ve given you an idea of the different types of potty chairs and seats, as well as their features, it’s time to take a look at our best picks. 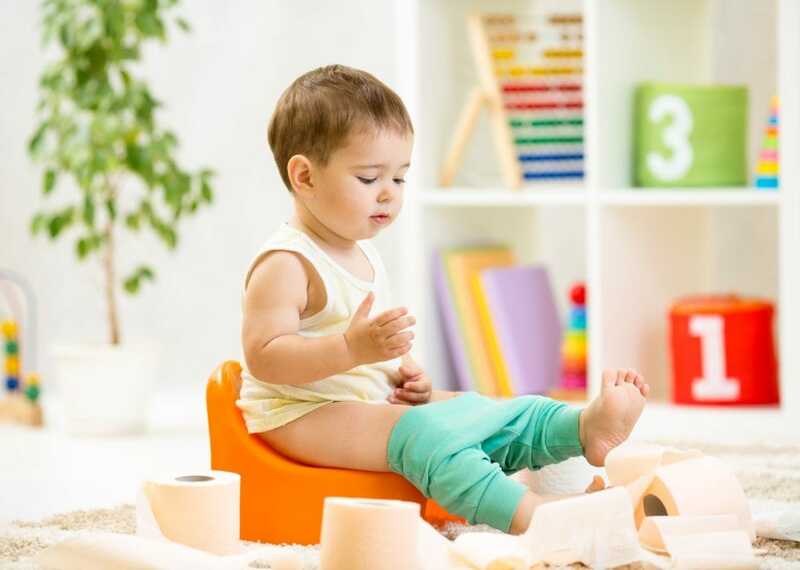 For older or larger toddlers, it's essential to find a potty chair of durable material. The potty has to be able to hold their weight as well as being tall enough so they can sit comfortably. This is also why I'm sure you'll love our pick for this category. If your toddler is taller or heavier, then you’ll love this potty chair from Baby Björn. They made sure to build it from durable material, making it sturdy on the floor. The chair is also a little taller, so long legs won’t have to bend uncomfortably. One thing your toddler will undoubtedly love is the high backrest. Here, they can sit on their throne and take their time, while doing their business in comfort. 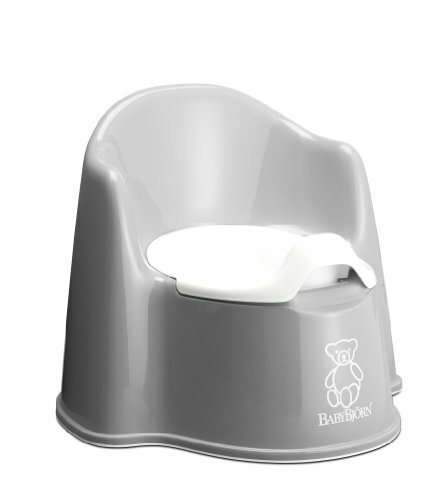 For the baby bums, this potty chair includes ergonomic lines so that the seat is as comfortable as can be. Baby Björn recognizes that toddler size and the age of potty training varies. This is why they made this chair to suit large as well as smaller toddlers. The high backrest makes it comfortable even for smaller users and as your toddler grows, they can continue using it thanks to the tall design. Additionally, the plastic used is 100 percent BPA-free, meaning you won’t have to worry about toxic materials. Sturdy and of durable material. High backrest and splash guard. Two-in-one design with easy waste removal. Some moms noted that their toddler’s bottom stuck to the seat after use. Potty training doesn't stop simply because you're traveling. Some moms recommend using a travel seat because they’re smaller and easier to carry, but that's not always ideal. Toddlers can feel intimidated by an adult toilet and forcing them to go could cause a setback. A potty chair is also useful when you’re nowhere near a public restroom! 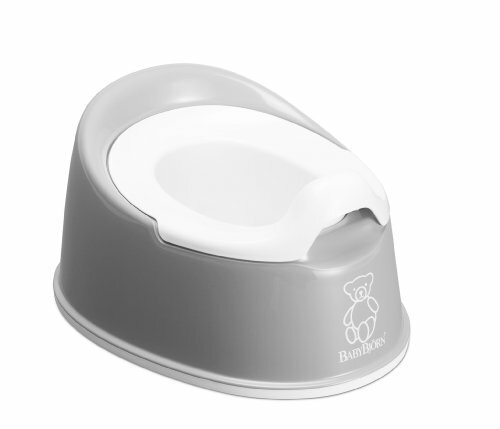 Once again, Baby Björn takes a spot on our list, now with their Smart Potty. Compared to the one above, the Smart Potty is smaller and lighter, perfect for trips. This smart potty is compact, taking up very little space in the car, and will even fit into a bag when you’re out and about. Fortunately, Baby Björn didn’t compromise size for comfort as they still include the ergonomic design. Another fantastic plus is the material. Again, it’s 100 percent BPA-free, but also durable and will carry your toddler’s weight. Additionally, at the bottom, there are rubber edges that will keep it from sliding on the floor. Some parents did point out that the splash guard was too small. Boys are always on the go, but when it's really time to go, it's essential that they aim right. One of the advantages of potty seats is namely that there's less clean-up afterward. However, it's a major advantage to find one with a large splash guard. 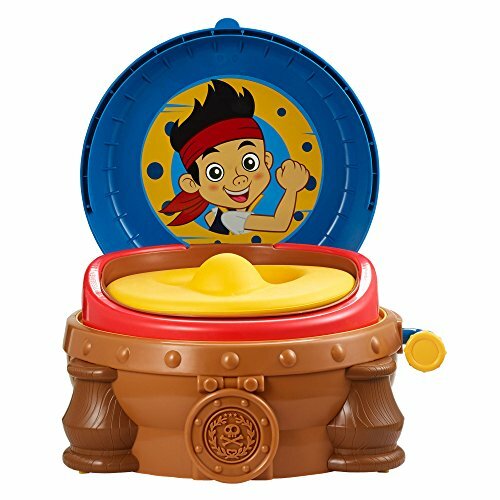 This potty seat from Boshaosumo is perfect for boys going through potty training. I chose this product because of the large splash guard. Having a boy myself, I know how messy toilet training can be — it gets everywhere. As well as the large splash guard, the seat also features a backrest and handles. Not only will this provide a comfortable seat, but it will also give some support if your child is new to the toilet. The seating area is soft and lightly cushioned. One feature that I love is the stability. Underneath there are adjustable arms that keep the seat firmly attached to the toilet. For extra security, Boshaosumo also included non-slip strips. However, it doesn’t fit all toilets, so make sure you check before purchasing. Removable seat for easy cleaning. Won’t fit all toilet seats. Only round or elongated seats. Little girls often love being independent, especially when it comes to the potty. Unfortunately, sometimes with a potty seat, it can be difficult for them to reach by themselves. To solve this, we’ve found this great product. If your little one is feeling ready for independence, this potty seat from GrowthPic is for her. The first feature I’ll mention is the appealing design. This potty seat is everything cute (can I have one?). It’s all pink shades, with an adorable bear theme. Besides the cuteness factor, it’s also comfortable. GrowthPic made sure to cushion the seat, so your little princess can sit for as long as she needs to. But what I’m sure your sass ball will appreciate most is the ladder. This provides some independence so she can go whenever she needs, all by herself. The step is wide, with grab handles at the top, and there’s non-skid material at the base, so it won’t slip. It also folds for storage. Toddlers love copying mom and dad — that's how they learn. So why should they use a potty chair that looks so different from yours? Having a potty that resembles an adult toilet might just be the motivation they need. This adult toilet lookalike from Summer Infant is an excellent choice for a realistic learning experience. It has all the right features, except a flush. What’s so much fun about this training toilet is the realistic detail. It has a pretend-flush handle, which makes a flushing sound. At the top, you have a small cabinet for toilet paper or wipes for your toddler. Your little one can open and close the lid by themselves and go whenever they need to. All you have to do is clean out the bowl. One valuable feature is the clip-on splash guard. It’s large and easy to put on and remove, which also makes it more hygienic. Storage area for wipes or underwear. Pretend flush with a flushing sound. The splash guard often doesn’t stay in place. Ask any mom and she'll likely tell you that potty seats are perfect for traveling. When on the road, you want something that's quick to set up, and easy to clean. You'll also want something that can fit a range of different toilets. If you’re often on the road, you’ll surely find this potty seat from Firares useful. What makes it ideal for traveling is that you can fold it down to fit in your bag. Or you can use the waterproof carry bag that comes with it. The material is hard plastic but folds in three places. When you reach the restroom, unfold it and it will stick to the seat using the silicone pads supplied. One advantage is that the potty seat will fit most toilets. Even the horseshoe-shaped seats you often find in public restrooms. It will support a child weighing up to 60 pounds. What your little one will love is that the seat won’t leave a gap where fingers or thighs can be pinched. However, although there are silicone pads to hold it in place, it can sometimes slip around on the toilet seat. Foldable to an easy-to-carry size. May not grip well to some toilet seats. Toddler boys are full of energy, even when it's time to go, there's no slowing down. That’s also why I feel it helps a lot to have a potty chair that looks fun and exciting. So for any moms of boys, I'm sure you'll love the next potty. If your little one loves speed and cars, then this potty from the First Years is perfect. 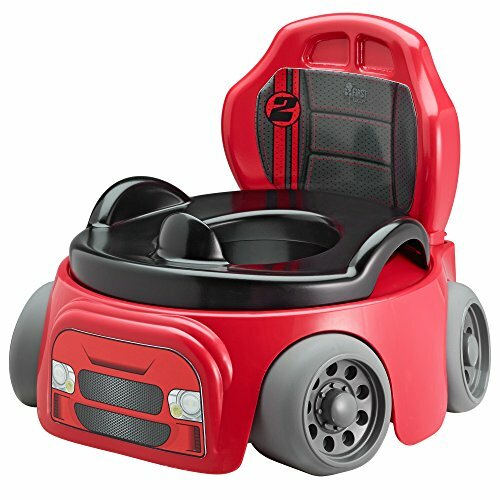 The potty chair is a small race car — it features a seat, four wheels, and headlight stickers. The colors are black and red, giving it some Ferrari appeal. But what we love is that this potty is a two-in-one. You can remove the inner bowl for easy cleaning or you can place the seat on the adult toilet. An additional feature you’ll surely appreciate is the large splash guard. This will ensure all the pee goes into the bowl. The potty also features handles and non-skid material on the wheels. However, although it’s claimed to be for toddlers age 18 months and up, some moms do say it’s quite small. Not big enough for taller toddlers. Imagine that you're a two-year-old, looking at that tall adult toilet — it's intimidating, right? Unless you buy a potty seat with a ladder, a step stool is a must. But remember, it has to be sturdy and safe. 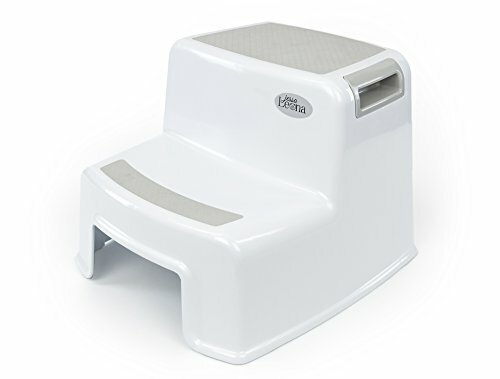 This step stool from Secure Home is the ideal stool for your toilet-training toddler. I chose this stool because of its dual height, meaning it will stay with you for a long time. It has two steps, where the highest reaches 10.3 inches. This is also a good height for reaching the sink to wash hands afterward. What I’m sure you’ll love is the sturdy design. With two soft-grip steps and a non-slip grip surface, it’s secure on any floor surface. And, although it’s lightweight, this step stool can hold a weight up to 150 pounds. That’s pretty amazing! What’s more, it has a simple, clean look. The white and grey colors will suit almost any bathroom without looking out of place. The great thing about this is how it can be used anywhere around the house, not only in the bathroom. It might even be useful for those of us who are vertically challenged to reach higher cupboards and shelves. Matching toilet training seats available. Useful throughout the home, not just for toilet training. The width is quite narrow. Younger children may need support as there are no sides or handles to hold. When you're a toddler, learning never stops — there are always new things to discover. When it comes to toilet training, the best we can do is make it interesting for young minds. 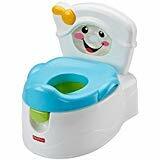 This potty chair from Fisher-Price is all about flushing. What sets this potty apart from the others are the musical sounds, lights, and “water” display. Once your little one finishes and pulls the flush handle, the screen will display a show with twirling water. There’s a bit more tech involved with this potty — you’ll need three AA batteries. But it’s so much fun for a toddler. The flush-show aside, this potty is pretty cool. It’s a three-in-one where you can remove the inner bucket for cleaning, or use the seat on the big toilet. It also has a splash guard for little boys. As amazing as this potty chair is, there seems to be one flaw — the batteries die pretty quickly. And once the batteries begin to go weak, it will start playing the flushing tunes randomly. When it comes to girls, we tend to think cute and pink. Unlike boys, girls sometimes need a bit more time to get it all out, and it's important not to rush them. 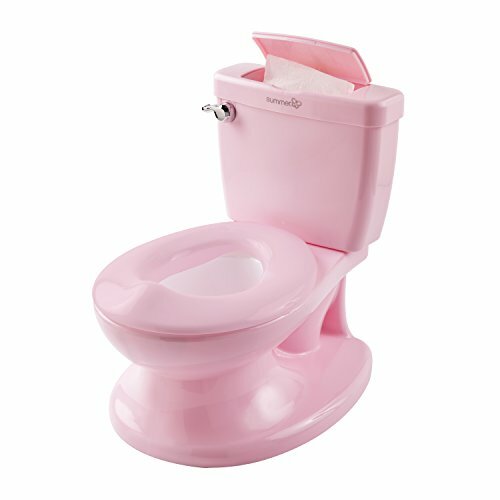 Finding a potty where your little princess feels comfortable is essential. Which is also why you'll love the next one. This Disney Baby Minnie Mouse potty chair from The First Years is perfect for little girls. One reason you’ll love this potty is that it’s a three-in-one. You’ll get a stand-alone potty with a removable inner bowl, a stepping stool once the lid is down, and a toilet trainer. Toddlers will love this because it looks like an adult toilet — it even has a pretend-flush handle. It’s all pink, with Minnie Mouse stickers, bringing that Disney vibe. When you close the lid, your child can stand on top and easily reach the sink. It’s made with durable plastic that’s strong enough to hold a toddler’s weight. However, it’s best to place it on a mat or carpet, since the rippled design on the bottom can make it unsteady. The shape of the base makes it unsteady when used as a stepping stool. Potty training is a big milestone, but it can take time. The big toilet might seem intimidating for a toddler. Fortunately, potty chairs and seats are the perfect tools to ease into it. That is also why I love the Baby Bjorn potty chair. It’s perfect for small as well as big toddlers and will grow with your little one due to its tall and sturdy design. Do you have any potty training tips for our readers? Leave a comment below. And before you go, please hit the share button.